UWM looks to deepen its positive impact in the city and region through community and business partnerships. Through this work, UWM boasts pervasive community partnerships, community-driven research, educational and research collaborations, contributions to economic development, and contributions to cultural and environmental quality-of-life. UWM has been named among the nation’s top universities for community engagement by the Carnegie Foundation for the Advancement of Teaching. The foundation created its Community Engagement Classification to recognize colleges and universities that benefit their communities in ways not reflected by the national educational data typically used to compile lists of top colleges. You can stay up-to-date on the latest Campus & Community news by visiting the UWM Report. With an emphasis on our overlapping urban educational and research missions, MPS, MATC, and UWM are combining and leveraging the efforts of the three largest urban and public educational entities of our respective types in Wisconsin to: close the achievement gap, provide trained workers to meet the needs of business and industry, strengthen the tax base and regional economy, and make social improvements in the form of lower poverty levels, decreased crime, and the improved well-being of Wisconsin citizens, their families, and communities. UWM isn’t just a university that happens to be in Milwaukee. We take pride in being a part of the community and helping this city thrive. We love it here! 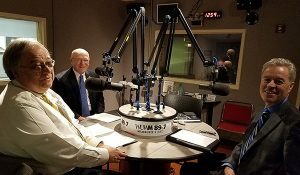 UW System President Ray Cross joins the chancellor and David Edwards on WUWM's Chancellor’s Report. The group discussed the governor's proposed budget.